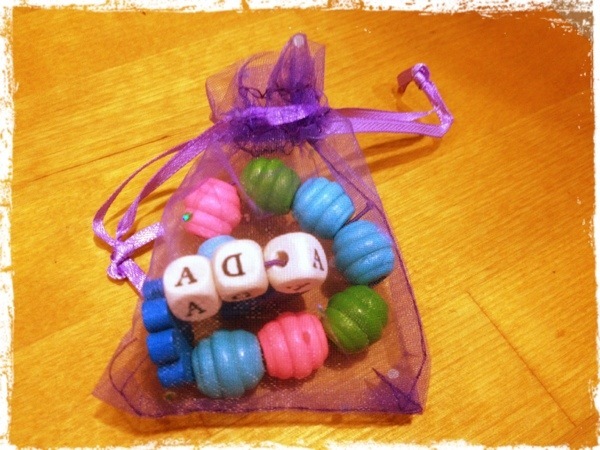 宝贝 has been wearing the bracelet, which she beaded herself at the Chiltern Charity Carnival. Since she liked beading so much, it seemed to be a good idea to start her off on it. I combed the shelves of spotlight for beading material. Just for the threading material alone, there were thin wires, thick wires, leather, plastic thread etc. That’s not even taking into consideration the various kinds of beads, pendants, crystals and even pearls!! Then the cutters, wire twisters and all!! Oh my… Making my head swim. I’m not exactly a very handicraft person and all those material were too sophisticated and small for a toddler to handle. I left, empty handed. Hmmm.. Maybe I should try qoo10 (gmarket) since it has almost everything. 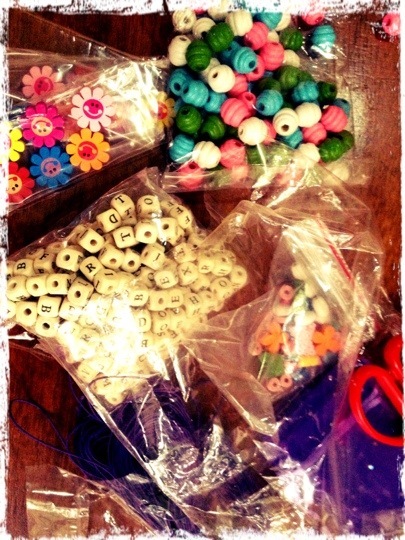 Lo and behold, I found an online store that sells all kinds of beads and even big ones, suitable for children. Similarly, the variety was mind boggling. I read the profile of the owner, and discovered that she has 2 very young children. So I emailed her for advice. She was really prompt in replying and mentioned that her 3 year old had problems sitting still for beading sessions. But I thought I’d try it on 宝贝 anyway. She recommended the elastic cotton thread that’s easier to handle for little hands and allowed room for alterations. 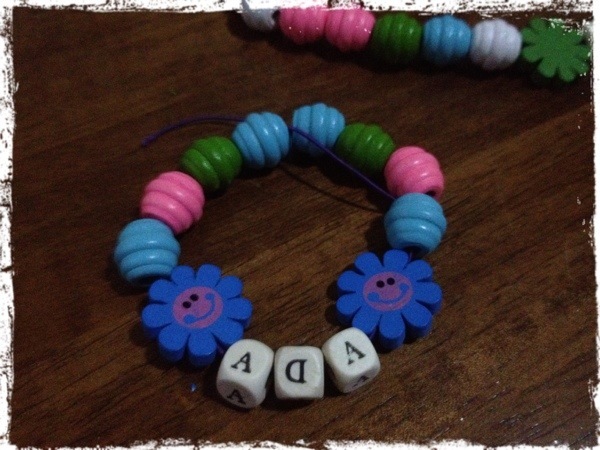 For the beads, her advice was to go for the ones with at least 2mm big holes. The great thing about her website was that the sizes of the beads and the holes were all clearly listed. The name of her shop on qoo is Creating Footprints Together. Here’s the link to her website. After placing an order on qoo, the package came really fast!! 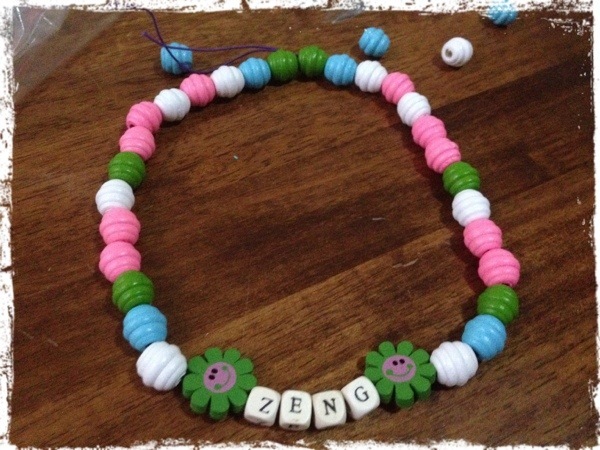 She started by creating a necklace for one of her teachers. We wanted to buy gifts for N1 teachers to thank them for all the love and attention they have showered upon her in the whole year. She decided that she should make the gifts for them herself. She picked out the letters of their names. This is good training for alphabet recognition. 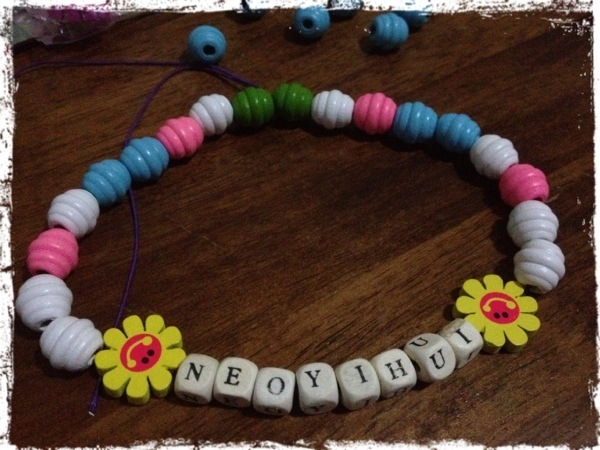 Then she decided upon the colours of the beads for one side of the necklace. For the other side I gave her 2 choices, whether to haphazardly thread them without any colour order or to thread them in a symmetrical fashion. She chose the latter. This trained her to recognize patterns and symmetry. 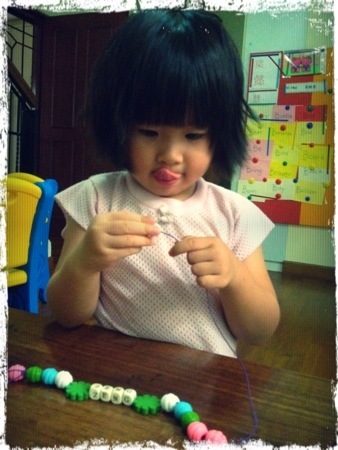 Then she sat there and threaded the beads painstakingly, one by one. It really took her a super long time. She made the last one for herself because she needed a little reward at the end of the session. Since she was already able to spell her own name, she picked out the letters without any prompting. All in all, she took 1.5 hours to complete 2 necklaces and 1 bracelet. Quite an astounding feat for a 3 year old to remain seated and in full concentration for that long. Their span of concentration usually lasts about 30 mins. She must really love beading. Hehe. 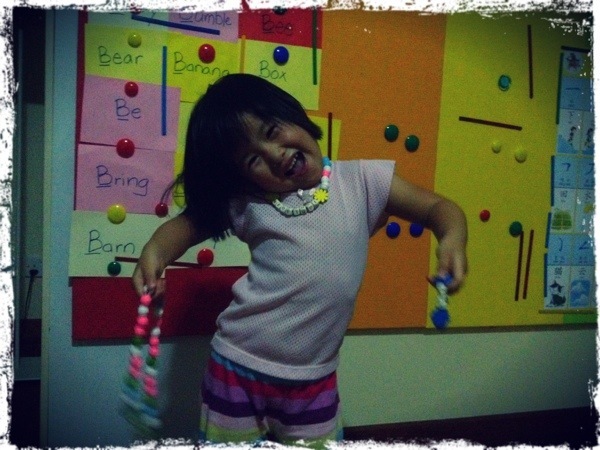 She’s put on the one she’s made for herself and held the 2 she’s made for her teachers. 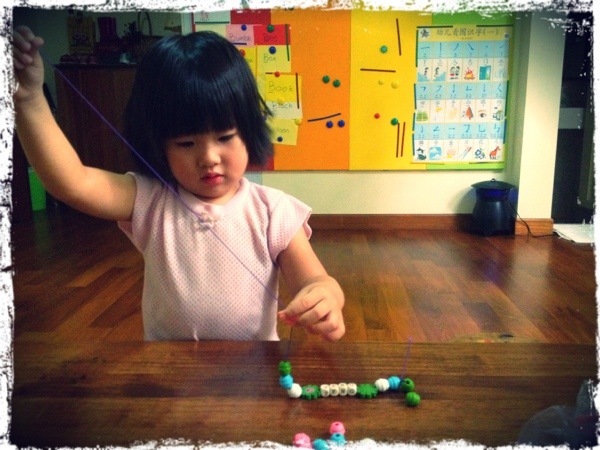 Beading trains : patience, concentration, fine motor skills, letter recognition, sorting, pattern recognition, symmetry.